This Amish Hardwood Large Single Pedestal Table with 13" Column is perfect for a conference table or large family table. This solid wood table offers many custom features to create a stunning, high-performing table. 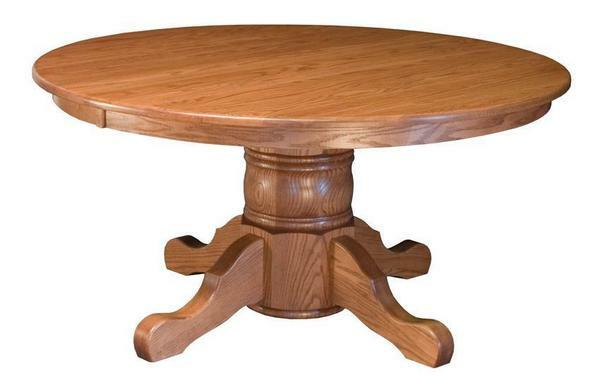 The Amish pedestal table is shown in oak wood with a 60" round top, a roundover edge and empire feet at the base. Would you like to add a Lazy Susan? If you would like to order a lazy susan to complement the table, they are available in a 24", 30" and 36" size and come in choice of oak, cherry, or quarter sawn white oak wood. A popular choice is to order the table in one wood and then order the lazy susan in a contrasting wood. The options are endless on how to create your custom table. Your new custom table not only comes in the wood and finish of your choice, but distressing options are also available. Light to heavy distressing is available to create a time worn, antique appearance. Burnishing--a technique that leaves the outer edges of the furniture a darker shade and the body of the furniture a lighter shade is also available. The possibilities are endless! You can select samples to inspect at home to find your favorite wood type and finish color. We are happy to provide personal assistance in choosing a wood type or matching one to your existing furniture. Please email or call one of our knowledgeable Amish Furniture Specialists for assistance. Thank you for taking time to shop with us. DutchCrafters is the leading online retailer for Amish furniture, connecting homes and families with the beauty of solid wood Amish made furniture. We can be reached by email or phone.